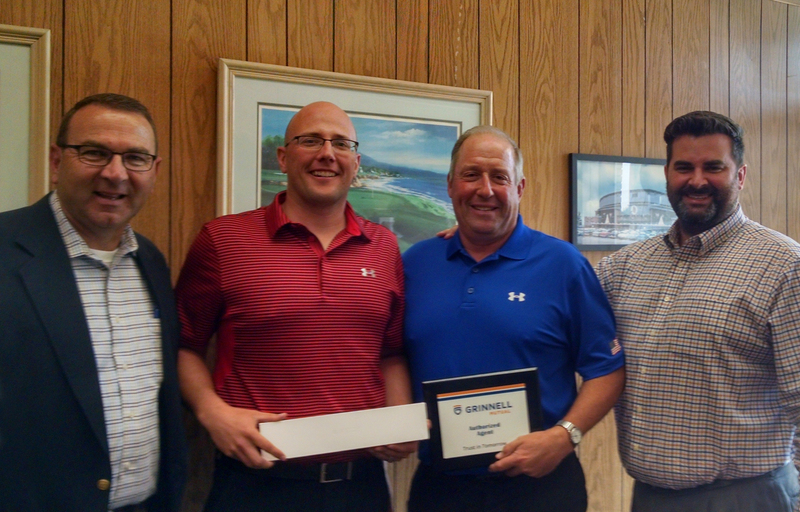 Service Insurance Agency recently won Grinnell’s new business incentive award. From left, Bill Gallagher, Grinnell Mutual sales director; Trent Haldiman, Service Insurance Agency; Tim Haldiman, Service Insurance Agency; and Adam Hade, Grinnell Mutual sales manager. Forward Mutual is proud to announce Service Insurance Agency, of Waterloo, Wis., was recently presented with Grinnell Mutual’s new business incentive award. Service Insurance Agency is one of 18 independent agencies carrying Forward Mutual insurance products. The award, offered by Forward’s reinsurer and partner, Grinnell Mutual, was an incentive to agents for writing new private passenger auto business. First prize, for the highest number of new policies written, was an Apple iWatch. Also, all auto advertisements (approved by Grinnell Mutual) qualified for 100 percent co-op during the incentive period. Forward Mutual Insurance Company offers an auto/home discount with their homeowner and farm product lines. Congratulations to Trent and Tim for their win and for all their new business!